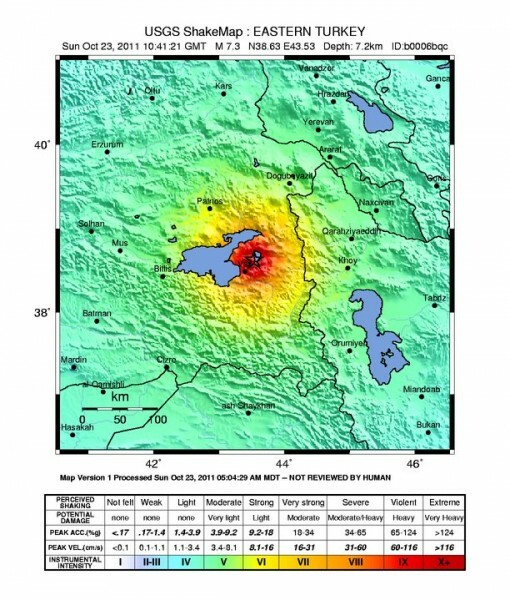 A devastating earthquake has hit Turkey near its border with Iran. A 1976 earthquake in the same vicinity killed 5,000 people. The Kandilli Observatory has reported that a very powerful earthquake measuring up to 7.3 on the richter scale has hit near the city of Van in eastern Turkey. Described as devastating and expected to worsen as a result of aftershocks, the earthquake will cause extreme shaking for approximately 49,000 people, violent shaking for 381,000 people, and severe shaking for 131,000. Although there are few details at present, Earthquake Report notes that the shake was felt in neighboring countries, which is a very bad sign, and that thousands of lives are at risk. Many homes have been destroyed, power has been cut in places, and many cell phones lack service.